I’m always on the lookout for unique experiences for my family. I love to be immersed in something, especially something that transports me to another time. 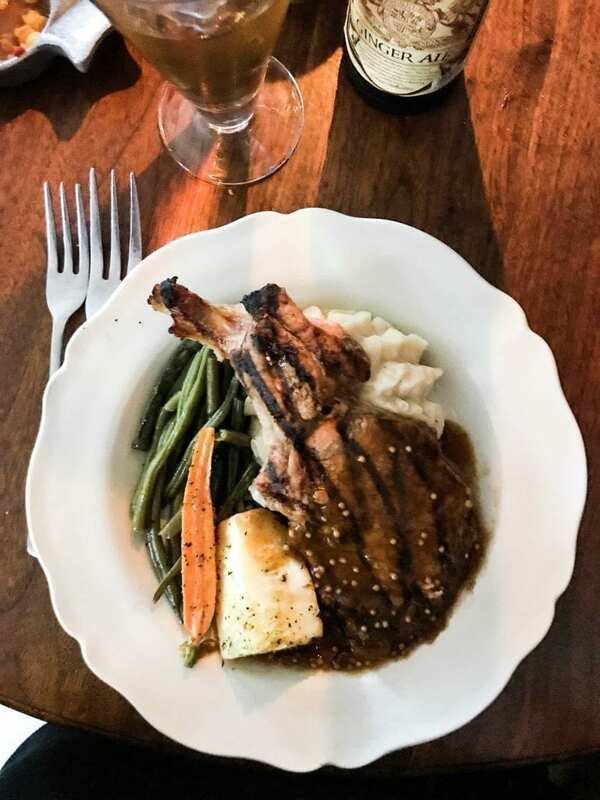 A tavern in Colonial Williamsburg does just that! 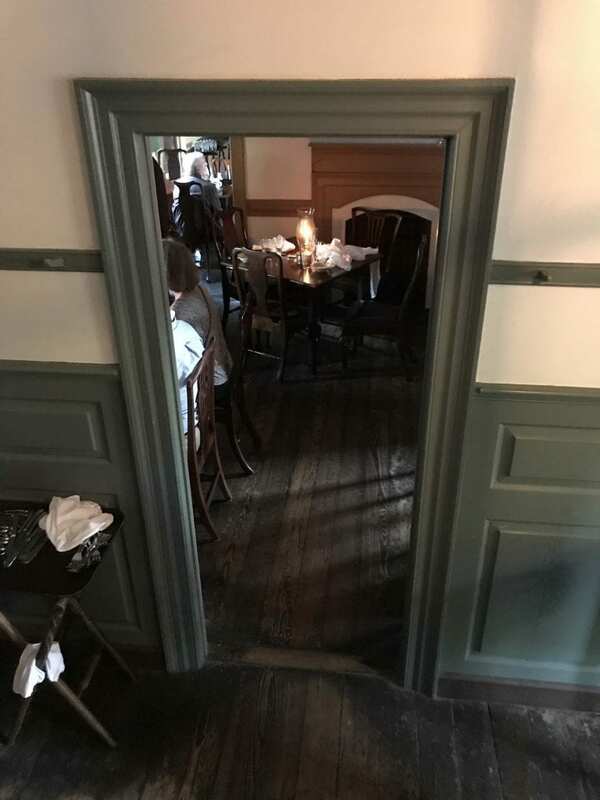 During our trip to Colonial Williamsburg, we decided to have dinner at the King’s Arms Tavern, and I am so glad we did! The tavern is on the main street–Duke of Gloucester Street. From a distance, it looks just like any other home or shop along the road. It is near a shuttle stop for taverns, and there are other taverns nearby. I had heard that this place can be impossible to get into for dinner without a reservation, so I made sure to make one a few weeks before our trip. I am a bit of a planner. 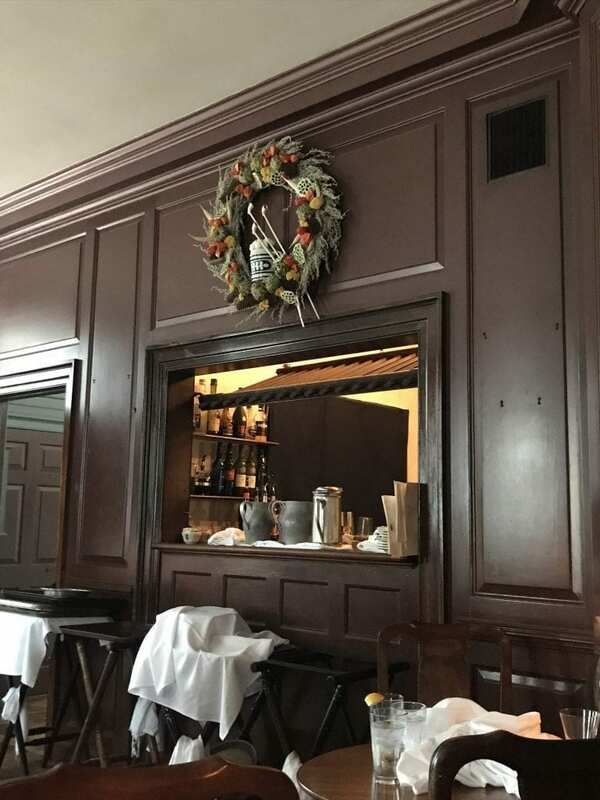 To make your reservation, just go to the Colonial Williamsburg website. You’ll be able to find the listing of taverns and make a reservation using Open Table. 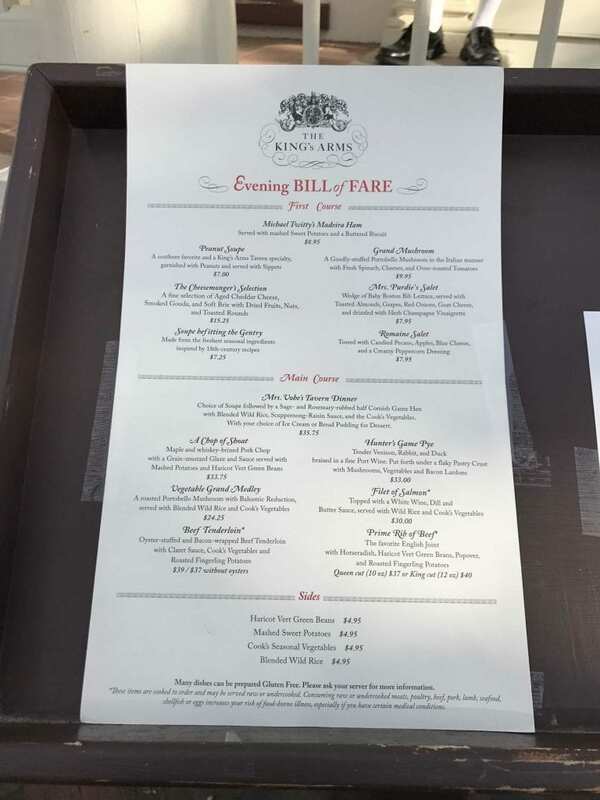 The menu features Colonial fare. It is a little pricey, but we budget for splurges when we travel. This was one of our splurges. Now, those of you who know us know that my husband Jeff is a picky person when it comes to food. I look for interesting places to experience on our travels, and I always look for a way to make him happy. My daughter Kristin seems to be a lot like him, so I have to take this into consideration. 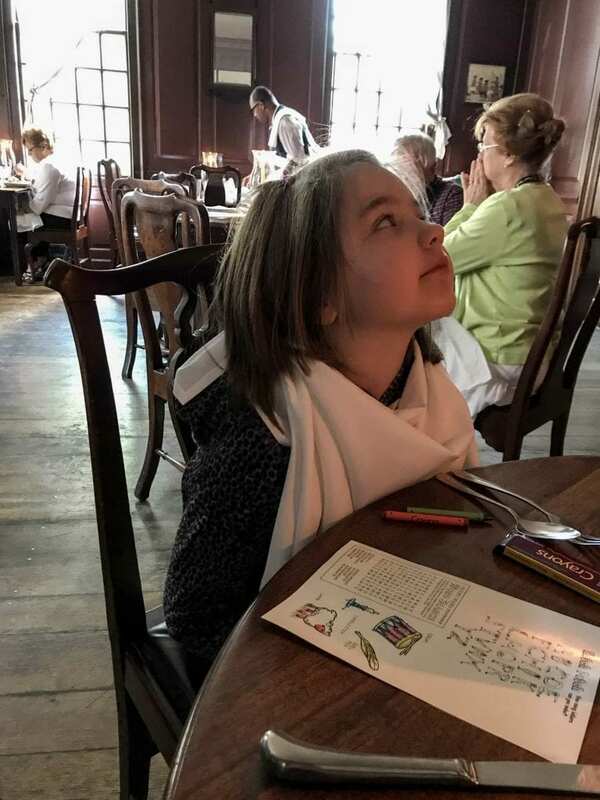 Often, we’ve found that a restaurant will let Jeff order an adult portion off of the children’s menu while charging an adult price, and that was true for the King’s Arms Tavern. Jeff was prepared to just order a drink while we had our immersive fun, but after asking the hostess outside of the tavern, she said ordering chicken strips would be allowed. The taverns do post their menus outside, and I found the menu online before our trip. The host or hostess will also be able to answer any questions you may have. We arrived back to Colonial Williamsburg after a short afternoon break early. Since we were taking the shuttle over, we wanted to make sure we had plenty of time to get to our reservation at 7:00 p.m. We made it there an hour early. Those shuttles are really efficient! We wandered awhile, but soon we found ourselves just sitting outside of the tavern. It didn’t look too busy. It was a weekday in early June, so we asked if we could be seated earlier. No problem! Soon, we entered the waiting area just inside the front door. It looked as Colonial as I had hoped. This was going to be cool! As you can see, no one was waiting to be seated at this point. This is another reason we love to travel in early June before many kids are out of school. 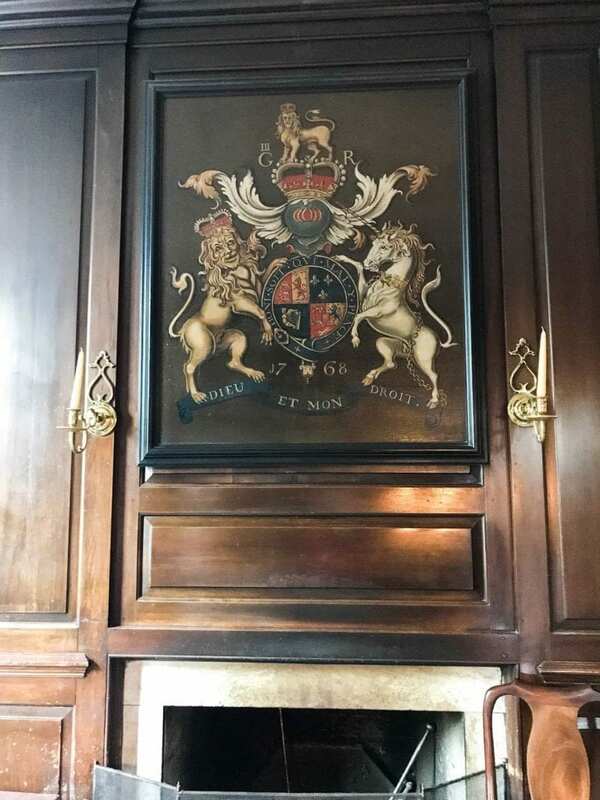 Here is a closer look of the coat of arms over the fireplace. And I couldn’t resist a picture of the pineapple over the door to our dining room. 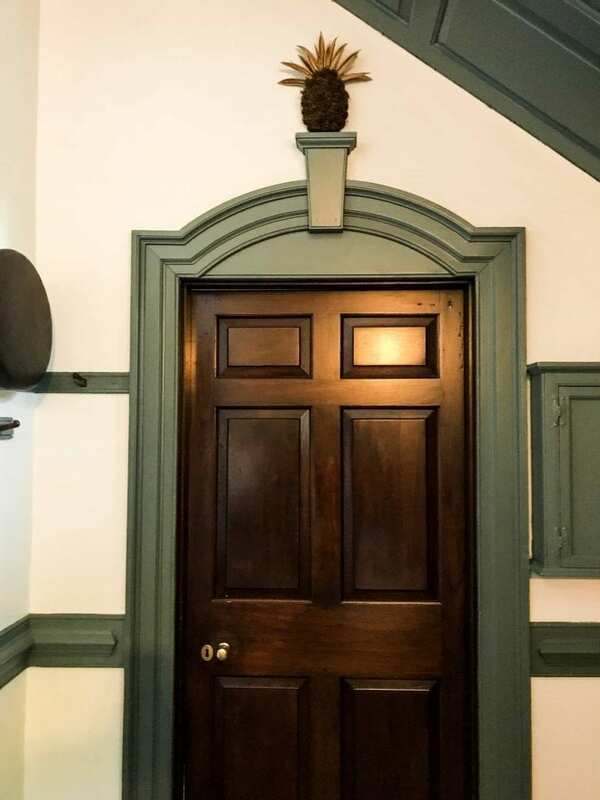 The pineapple is a symbol of hospitality in Williamsburg. If a colonist were wealthy enough, perhaps he would offer a pineapple obtained by trading with South America to a guest as a token of welcome. The pineapple can even be found in the architecture and decorations around Williamsburg. We were seated in a lower level dining room. There are also dining rooms upstairs. Our table was set in a traditional Colonial way. Behind our table was a fireplace, although there was not a fire this evening. We also had a view of the bar. It is full service. 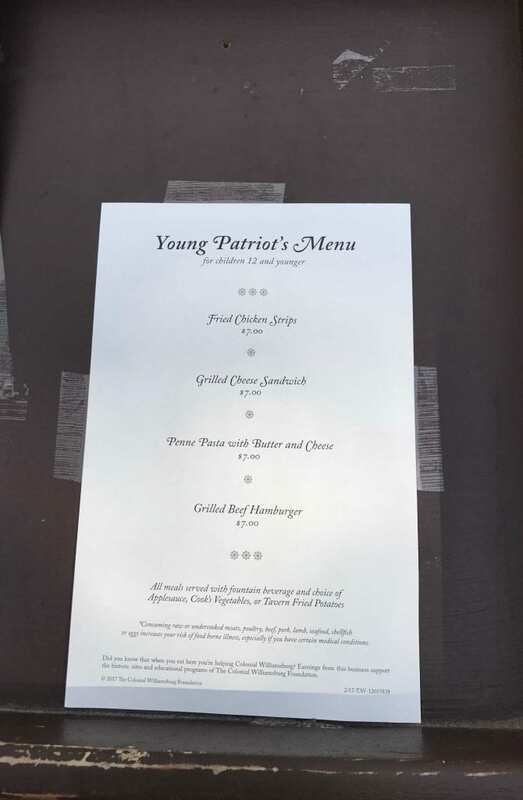 You can also order beer or punch with a Colonial flare. 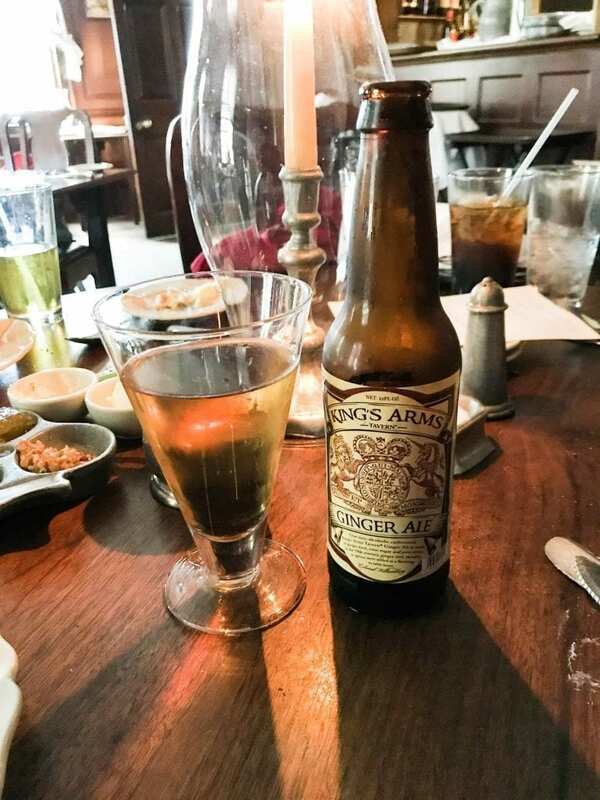 Of course, you can also do what I did and try a bottle of King’s Arms Ginger Ale in the bottle! 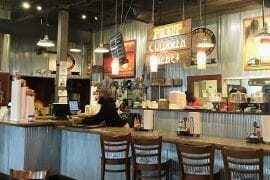 The dining area was cozy, and I really enjoyed the ambiance of the place. 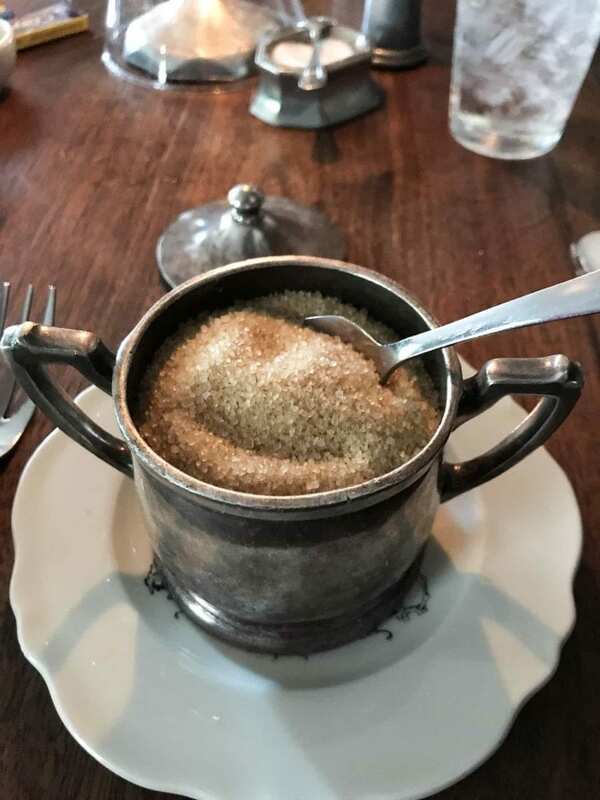 After our server brought our drinks, it was time for bread service. The bread was so soft and good. 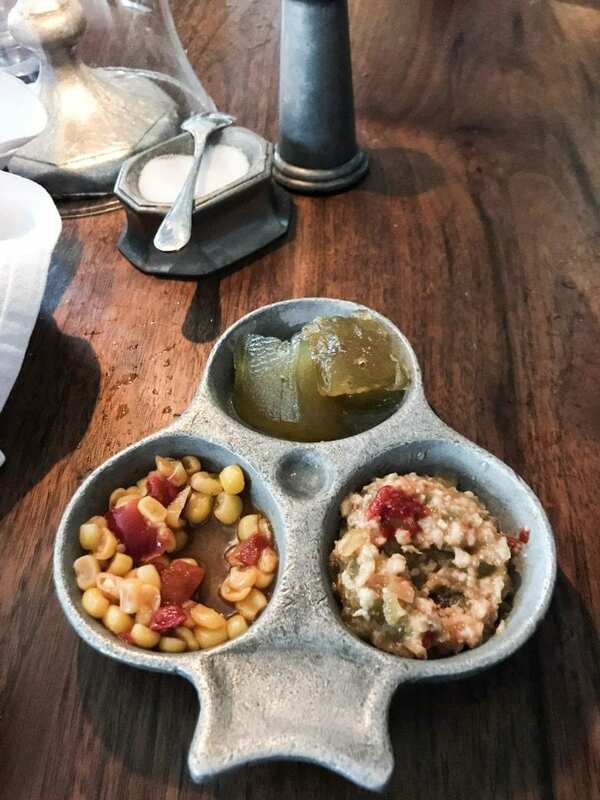 She also brought out a relish tray of pickled foods. We had pickled corn, pickled watermelon rind, and chopped ham. Our server reminded us that it was difficult to preserve food at the time, so there was a lot of pickling happening. I was alone in trying each one, of course. I thought they were pretty good, actually. We were told we could put them on our bread or use them on our entree. I just sampled each with my fork. We also learned a little bit about using cloth napkins in Colonial days. We apparently get a lot of our phrases from this, like “making ends meet.” If you were wealthy enough, you could have a big napkin that tied around your neck with enough cloth for the ends to meet behind your neck. Our server tied this napkin around Kristin. She was NOT enjoying it. After I snapped the picture, she took it off. The napkins were huge! Our entrees arrived without too much of a wait. I ordered “A Chop of Shoat.” It was so tender, and I loved the mashed potatoes. The vegetables were not my favorite. They were rather firm, but I like my cooked vegetables really soft. Of course, my travel companions had the ever so scrumptious…chicken strips and fries. Here is a picture of Jeff’s plate so you can see how big the adult portion is should you need this information for the picky eaters in your family. 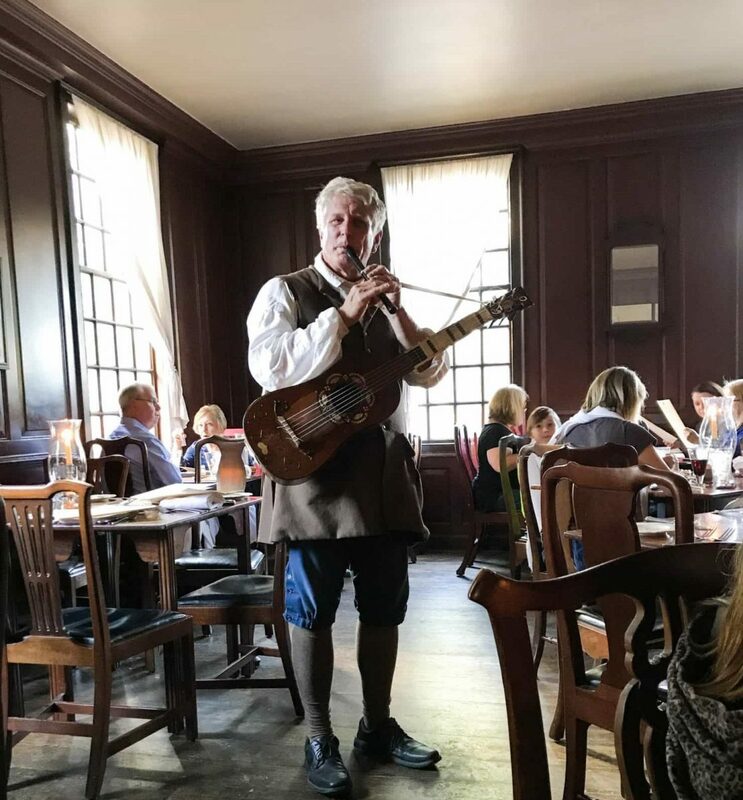 While we dined, a musician appeared to serenade us with Colonial-style music. The music just made the experience complete! Sadly, we had no room for dessert. If I could’ve made it work, I would’ve had some bread pudding. I saw someone else’s, and it looked good. I just couldn’t do it. After we paid the check, we headed upstairs where the restrooms were. There are also dining rooms upstairs. We were told it was okay to explore a little. 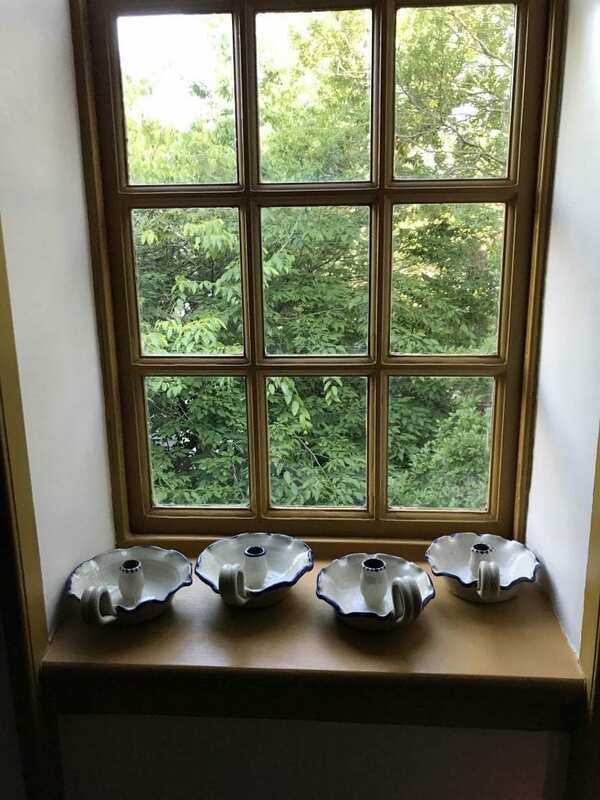 This window is in a hallway upstairs. We could look down from upstairs into this dining room. We had a great time at the tavern, and I am so glad we did this. It is pricey, but if you know me, you know I’m working to save up all year so that we can have some fun experiences like this. I also use my earning sites like Swagbucks and MyPoints to chip away at our traveling costs. If you are on the fence still, I would encourage you to give it a try. 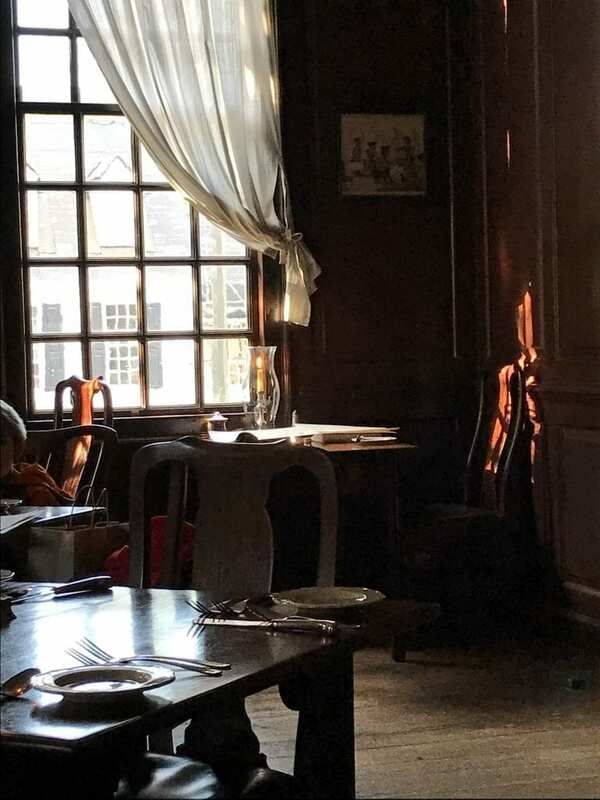 I will always remember this dining experience at the King’s Arms Tavern at Colonial Williamsburg! 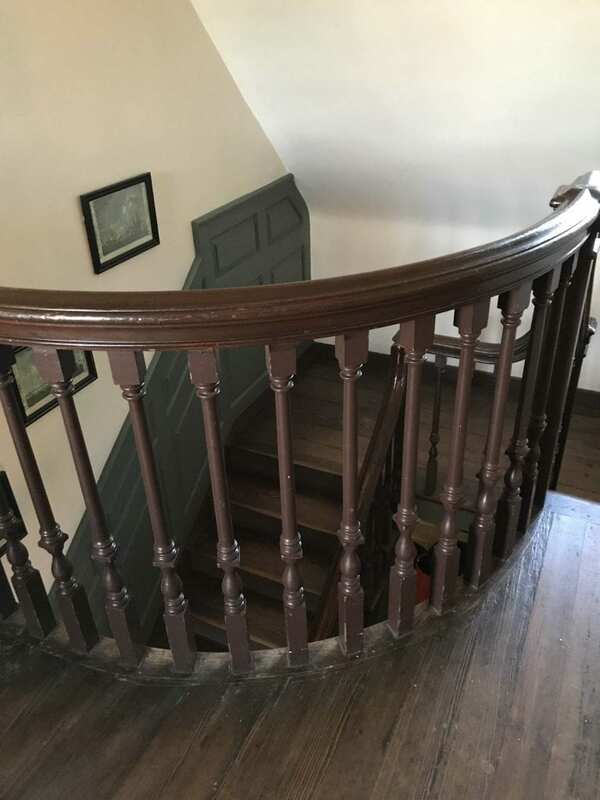 If you’d like to read more about our visit to Colonial Williamsburg, click here! What a fun dining experience! The building looks so cosy too. Sometimes a splurge where you’re getting something different is so worth it! I agree! We work hard to play hard! Dinner with some history lessons! That’s awesome. I never knew about the making ends meet. Interesting!!!! I liked the historical aspect, too. It was such a memorable experience. It really looks like a unique experience! I’m happy I learned the story behind the pineapple over the door. I’ve never tasted pickled watermelon rind, but I think it’s pretty nice that they served it and that the server thaught you more about history. It was fun to hear the historical side of things. I learned a lot during our dinner! Looks such a cozy place! Never heard of a place where you get historical stories while dining! It really is a unique place to dine! I agree! I think I could live in Colonial Williamsburg! Your pictures are so fantastic! Really cool place to visit! I dont know this is possible, but I have never been to Colonial Williamsburg!!! Now Im thinking about it, its probably a place my kids are a a great age for… adding it to my list! Plus this meal looks great! My daughter loved it! There is a lot of hands-on things to do, and it really is like stepping back in time. What a neat experience! And, I love posts that teach me stuff – like that a pineapple was a sign of hospitality and the origination of the expression “making ends meet.” Thank you for posting this! I love to learn historical information, also. 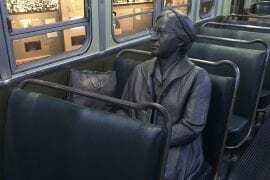 Our trips always include a bit of history, one way or another! It really was a great experience! I’d recommend it to anyone! I simply love these old buildings, specially when they are decorated with old furnitures inside as well! It is a time capsule, makes us totally feel like we were transported to another time! I agree! It’s an amazing place to visit! What a darling place! I am a history teacher so i completely get off on this stuff! I love all the details they have. As an Aussie we just don’t get this kind of detail in our restaurants and historic homes as we are pretty young. But i love stepping back in time and seeing all of these things. What a great time. Ps The chicken tenders looked good! I love history, too. I teach English, and literature and history go hand-in-hand. There is certainly more Colonial history in Virginia than what I normally experience in Missouri. I’ve never visited a themed restaurant like this before but it looks really fun! It really was a fun experience! I love immersive travel experiences! What a great way to learn about a place and it’s history. It’s my favorite way to learn! How sweet! Thank you! I absolutely loved Williamsburg, and I think you will, too! This is such an interesting place. Reminds me of old western movies. It’s sometimes so cool to go back in the past and have a totally different experience like in the old days. Great post! I love history, so I agree! I like to experience the old days! This looks like such a fun experience. I think the whole ‘budgeting for splurges’ is such a good way to travel (we do the same) because there are some truly unique experiences you can get if you pay a bit more, even if that means saving to hire a car for a day to explore a different area! Yes, we try to make little cuts all year and I try to earn with my programs I belong to. People tell us all the time they “couldn’t afford” to do something. And sometimes that is true. But often it’s how you choose to use your “entertainment” funds. We don’t do a lot during the year so we can do trips and special things on them. For example, we don’t go to the movies, we cut out cable TV, etc. The little things add up! It really is a whole experience! 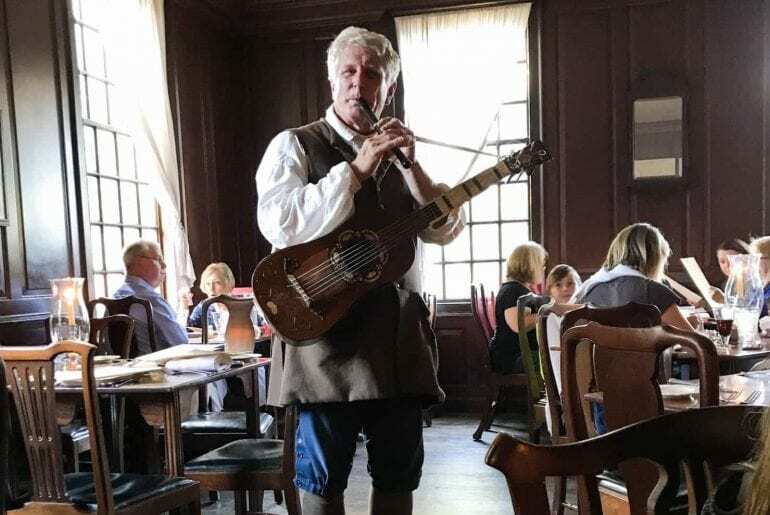 As soon as I heard about the taverns in Colonial Williamsburg, I knew I wanted to try one! It really was a great experience. If we go again, I think I would even try another tavern to see what it is like! Thanks! Sometimes I worry that I give too much detail! This place is amazing! I love history too, so to learn some and eat.. perfect. The tavern is also beautiful! Would defo go here and eat! Thanks for sharing! It’s great to learn history by eating! First of all, I love the title of your blog, it brought a smile to my face. As I have a lot of American friends, I have heard a lot about Colonial Williamsburg. Being a foodie and someone who enjoy a little bit of history, this looks and sounds like the perfect place to have a meal. Having the musician is a nice little touch and the architecture is text book colonial. Thank you! 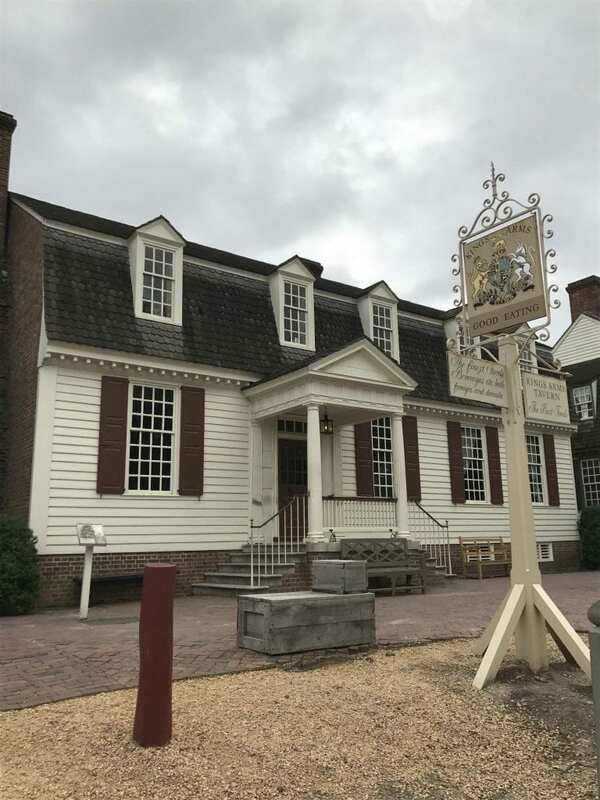 You should visit Colonial Williamsburg if you love history. It’s like walking around in a history book! You weren’t kidding about this being a step back in time! The detail in the King’s Arms Tavern is so intricate, I love the olde style menus, to the condiments holder, and the ginger ale bottle! This plus the food looks yummy. This is one place to bookmark! Yes, the details made it really great! This looks like my kind of places. 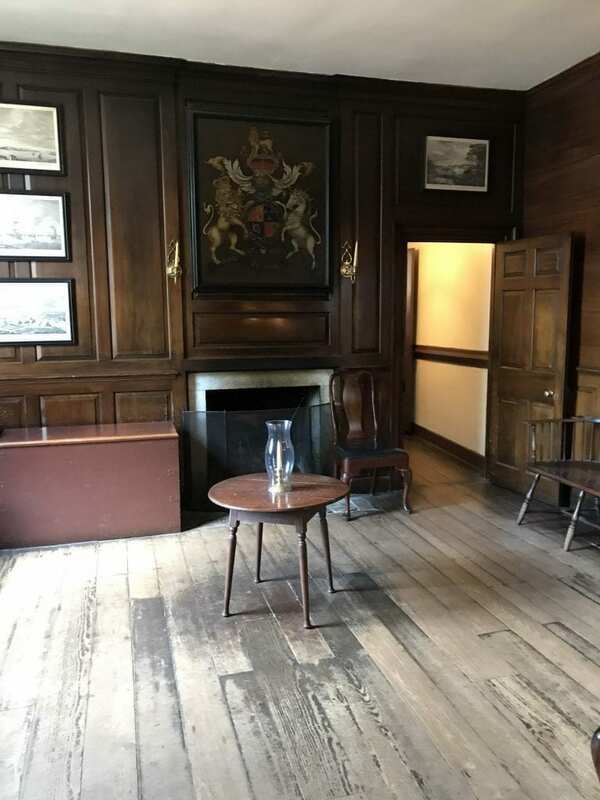 I’m all for these colonial places with vintage vibes. I’ve never used napkins when I dined in. And pickled corn sounds so interesting. I just had breakfast but damn it, I got hungry again just reading this post! I absolutely love the interior and decor here, too. What a unique experience! It really was a great experience! The food was good, too! It is like stepping back in time! It looks like you had a great time with your family! We had a great time! We’d love to go back! The place looks incredibly beautiful! I’m a total sucker for anything that old and heritage associated! You’re right, its a bit on the pricey side, but instead of thinking of it as a meal, we’ve gotta think of it as an experience!!! I agree! It is a total experience! This looks like such a fun thing to do. My mum would love this! She’s always going to places like this in the US. So much attention to detail and I love the music! 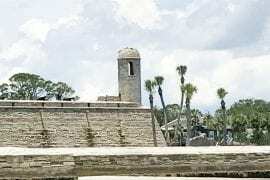 It really is a great place to go if you love history! I am a huge history and music fan who loves to eat. So this is a perfect experience for me. And you captured all the details along with beautiful pictures. This is a really gorgeous place; it looks like it’s been kept very authentic. I’ve heard of Colonial Williamsberg but have never read anything about it. 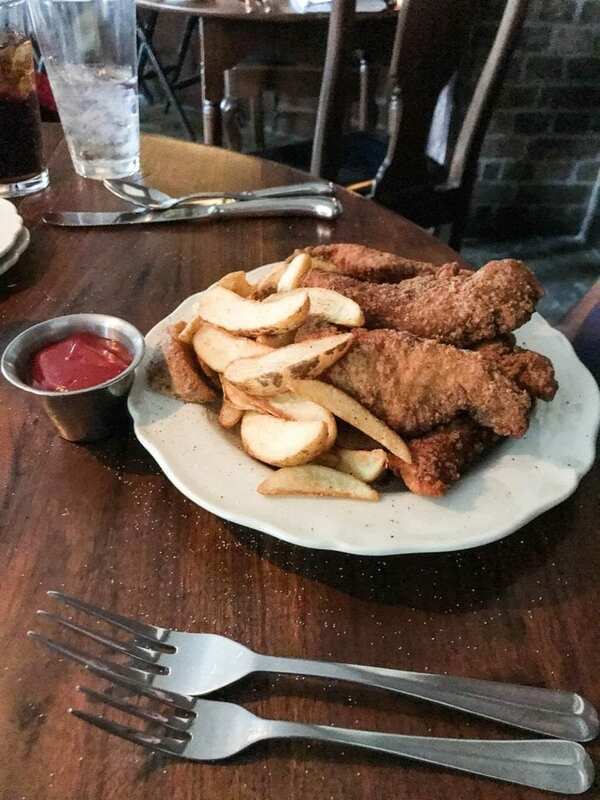 I love the history here and the food looks lovely too – those chicken strips are huge! It is a beautiful place. And the chicken strips are huge!